If you have a swing set, slide or jungle gum in your backyard, covering the ground underneath with high-quality playground wood chips makes the area safer for your children. Engineered wood fiber provides a soft cushion for the inevitable falls and tumbles – and don’t worry, the chips aren’t at all likely to cause splinters. But with playground wood chips, you shouldn’t take the set-it-and-forget-it approach. For optimal safety, the play surface needs a bit of maintenance now and then. When you first place wood chips in a backyard play area, the amount you need depends upon the height of the playground equipment. For equipment up to 5 feet high, experts say to start with a layer that’s 12 inches deep. The surface compresses over time, and it will settle to about 9 inches – which is the depth you need to keep the play space safe. If your playground equipment is less than four feet high, you need to start with a depth of at least 6 inches. Use less than that, and the chips are more likely to become displaced. Now, the amounts listed above are just starting points – as your children run around and play on the equipment, the playground wood chips will begin to thin out. When it does, you’ll need to replenish the surface to maintain the minimum recommended depth. An easy way to know when it’s time to add more engineered wood fiber is to use the playground equipment as a guide. Mark the correct level on the support posts, and you can clearly see when the surface is too low. As we mentioned, wood fiber chips get packed down with use. To combat the compaction, take a rake to the play surface once in a while – tilling makes for a softer, looser landing spot. 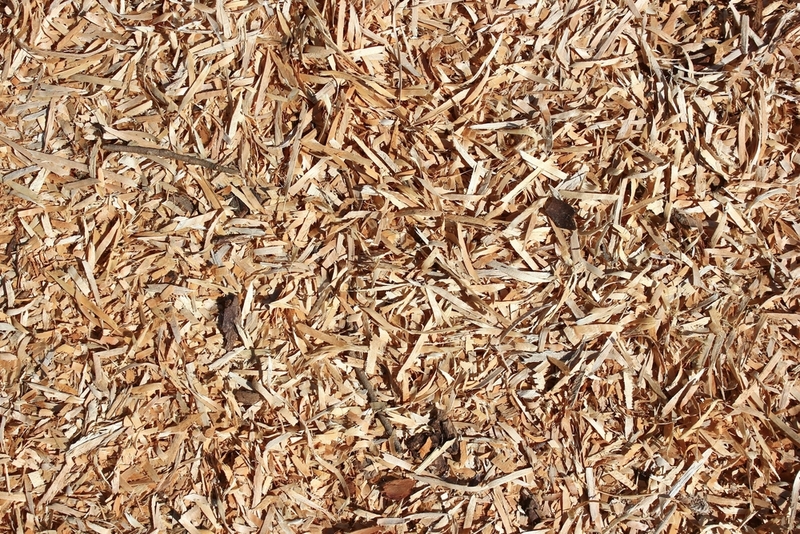 You’ll also want to rake the engineered wood fiber you have in the playground area before you add more. By tilling the surface first, you won’t have a hard, compacted layer under the new wood chips. To keep the wood chips where they belong – and prevent them from overflowing from the play area into the rest of the back yard – install a border around the playground. Line the edges with landscaping rocks or edgers, or simply dig a trench along the perimeter. But, don’t forget to consider water drainage, as you don’t want the playground to get water-logged when it rains. When you’re ready to cushion your children’s backyard play area with engineered wood fiber, you need a reputable local supplier of high-quality landscaping materials. If you live in northern Utah, turn to The Dirt Bag. A locally-owned and operated company based in West Jordan, The Dirt Bag offers a range of premium landscaping materials, and all of our bagged and bulk products come with affordable prices. To place an order for high-quality playground wood chips, contact The Dirt Bag today.